Part of the fun in spending two and a half years sifting through random text-based software has been the occasional joy in finding something amazingly cool. On occasion I’ve stumbled over stuff I didn’t even think was possible, and yet there it is, in plain view. 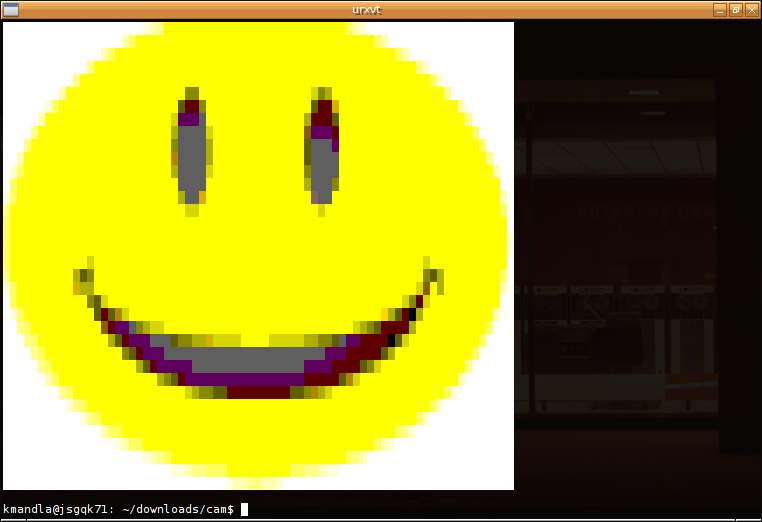 That’s Martin Bruchanov’s shpaint, which is a simple, mouse-driven ANSI art editor for terminal emulators. You can probably figure out how to use shpaint just by looking at that screenshot; click on a foreground color, a background color and a glyph, and click away until your artwork is complete. If I have 180 lines to work with, I’m lucky if I get “Hello, world” to appear on the screen. shpaint isn’t perfect, but that doesn’t detract from its coolness. For one thing, it doesn’t work in a virtual console; I tried to fire up gpm and draw my rendition of the Mona Lisa (imagine a stick figure in garish colors), but apparently shpaint doesn’t work that way. shpaint also can’t really do more than plot a glyph at a time. No line functions or paint-fill buckets. You have to do this old-school, like we used to do things back in the 80s. Martin admits that occasionally something goes haywire between shpaint, bash and the terminal emulator, and clicking a cell will cause weird and random painting effects. That happened to me once or twice, but the fix is easy — just exit shpaint with CTRL+C, which saves your file automatically, then restart it and all is well. shpaint sends your rendition of Whistler’s Mother to a flat file that will spill out the same image just with the cat command, meaning you can probably work this into other, more advanced editors to handle more intricate touchup. Don’t feel guilty doing that; our artist at work regularly sketches with a pencil, then scans her work into a computer and does everything else in Photoshop. In fact, I’m no Picasso, but I daresay there are probably some parts of text-based artistry that would be well-served by relying on shpaint as an option to aewan, cavewall or duhdraw, even if it’s just for the speed of plotting points with the mouse, as opposed to cursor controls. This entry was posted in Linux and tagged art, draw, edit, illustrate, image, text on 2015/04/18 by K.Mandla. In a rather odd twist, I have two programs entitled “cam,” one which has a visual focus, and another which has an audio purpose. Let’s start with the eyes. And I am beginning to believe that tools that translate from standard image formats to terminal output are not so rare after all. This cam is available in the AUR as cam-git, but to be honest, the version given there wouldn’t build for me. However, following the instructions on the home page made a workable cam, and as you can see, it converts our old pal Smiley into its text-only version with no real effort. It also manages a fair representation of the original colors, and shades things appropriately where it can. cam also squeezes its output to fit the current terminal dimensions, without losing the aspect ratio — something I liked in the last converter we saw, and in others from years past. cam seems eager to take on the role of a slideshow tool as well, with options for pausing between separate image files, preset looped shows, sizing in proportion to the terminal dimensions, and eight- or nine-position alignment that overwrites the current terminal content. It’s a nifty effect. This cam is a solid thumbs-up in terms of graphics viewing for console environments, and unless you have something specific that you need from another converter tool, it might usurp others you already know. Here’s the other cam, which is an acronym for CPU’s Audio Mixer. I’ve looked high and low for a home page for this cam, but the only sites I can see in the source code, and the only addresses I find in the Debian packages are all dead. Which might be a foregone conclusion, since cam’s source codes show dates as early as 1994, and I don’t expect the home page for an OSS-era audio mixer to survive 20 years until now. Not that it can’t be done, only that it doesn’t surprise me if it didn’t. This cam seems to work well in hand with alsa-oss, but the only mixer controls I can muster are the ones you see in the screenshot. 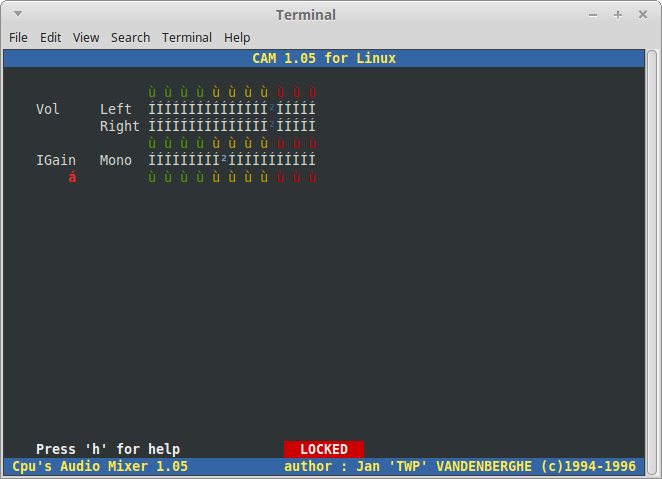 I also can’t account for the oddball characters used in cam’s display, but I’m willing to either chalk that up to cam’s age, or to my less-than-expert setup, or using the Mint live environment. Any one or all could be a factor there. This second cam might be a little less useful for those reasons, but it also has most of the requisites I look for in a decent console application — good use of color, onboard help and key cues, and a straightforward focus that doesn’t wander all over the map. This entry was posted in Linux and tagged convert, display, image, view on 2014/12/24 by K.Mandla. 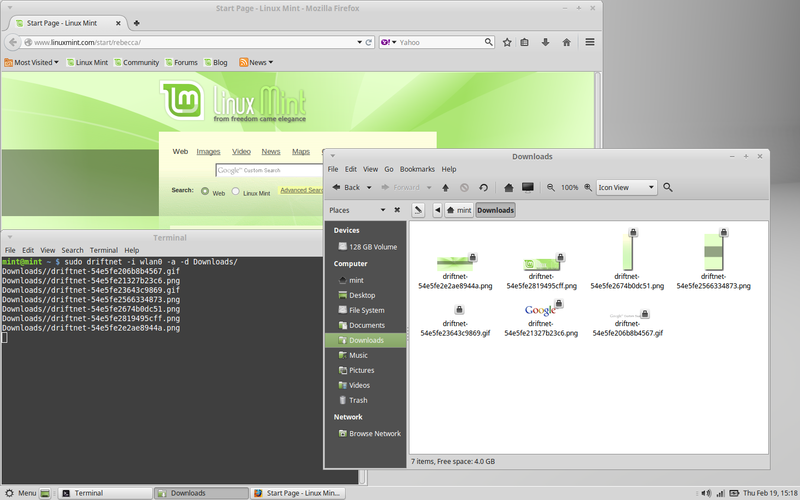 Quick, nimble, short and fast programs are always to my liking. We’ve been through plenty of image-to-text converters for the console, but here’s one that just plain works, on the first try: jp2a. I’m showing two screenshots there because I wanted to point out one small thing about jp2a that I really like: It’s smart enough by default to keep the original aspect ratio, and confine it to the available terminal space. I know that seems like a small issue, but the original smiley face image that I used was 1024×1024, and some utilities try to convert that as pixel-to-character, on a one-to-one basis. Which complicates things. jp2a can certainly do that, and if you dig through its flags you’ll see that it can do quite a bit more too. I used only the --colors flag to generate the images above, but you can set output dimensions, redirect to a file, flip an image on conversion, put borders on output and a mess of other options. If you’re looking for a quick, fire-and-forget conversion tool this might be the one. And given that it has only libjpeg (and curl) as its dependencies, it definitely won’t burden your system with random and impractical features that draw in obtuse libraries. 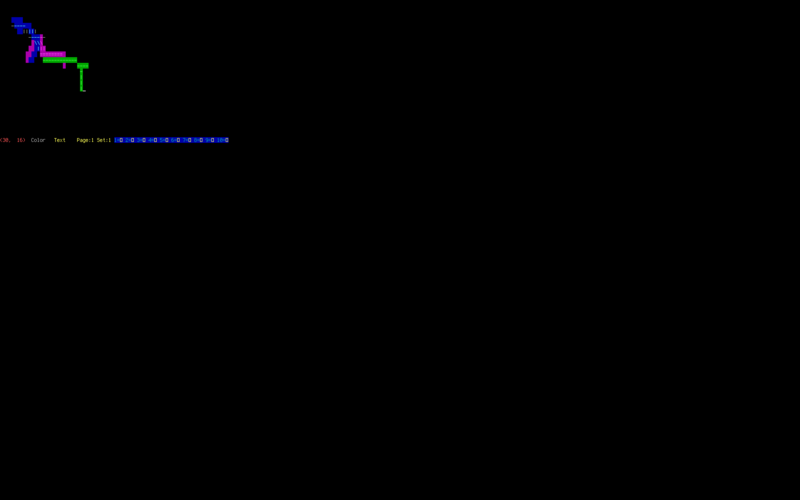 This entry was posted in Linux and tagged art, ascii, convert, image, text on 2014/12/16 by K.Mandla. Having a near 20-year history may make it look weak when compared to tools like aewan or cavewall, or even cadubi, but duhdraw might still have a few tricks up its sleeve. That is not the world’s strongest screenshot, and for that I apologize. That was my passive-aggressive way of pointing out that duhdraw, regardless of your terminal dimensions, is going to confine itself to that small window. Your canvas will actually stretch down to about 1000 lines, if the README file is to be believed, but width-wise, 80 appears to be its limit. And the unreadable characters there in the screenshot are supposed to be “high ASCII” characters — pipe symbols and others, I believe — but were not properly rendered by my framebuffer …. or by rxvt-unicode, which was more disappointing. It may be a sign of its age, but apparently duhdraw had trouble reaching that high. Most of duhdraw’s features are accessible through ALT keys, so the help screen, for example, is ALT+H. Erasing the canvas and starting over is ALT+E. Saving is ALT+S and loading is … well, you get the picture. I found a copy-and-paste feature, such as was in cavewall or aewan, but it seemed quite primitive (or perhaps was incomplete) to me and hard to control. No transparent stamp effects or editable polygons, sorry. duhdraw is not without its own interesting gimmicks though. ALT+D enters a line drawing mode, where just moving the cursor begins a continuous line you can control. And I like the pickup commands of ALT+P and ALT+U, where you can instantly adopt the character and the color scheme of any character on the screen, and use it elsewhere. It’s quicker than running back and forth to the ALT+F keys for the color palette. And attribute mode is even easier, turning your cursor into a sopping wet paint roller, wherever you go on the screen. And to be honest, trapping commands against the ALT keys is a good way to do business, since it frees up virtually every other key as a stamp, without losing out to shifted characters or special sequences. I like the way duhdraw does that. It’s unfortunate that I couldn’t see all the characters duhdraw offered, because I have a feeling that duhdraw had more interesting approaches to ASCII art than just what the bigshots like aewan or cavewall could offer. This entry was posted in Linux and tagged art, draw, edit, illustrate, image, text on 2014/11/17 by K.Mandla. I’ve seen about three or four ASCII art editors for the console now, and it’s becoming clear that each one has unique features that are very appealing, but misses out on something another one offers. 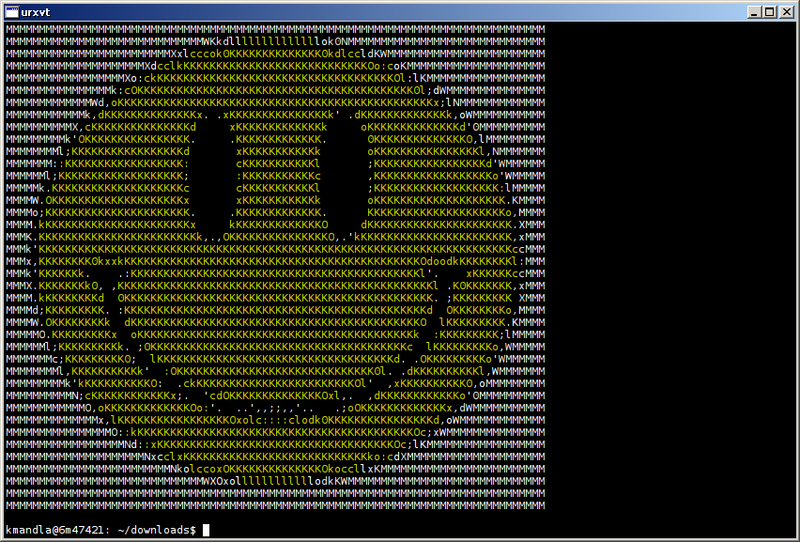 After I found cavewall, I figured any other ASCII art editor was going to fall flat. After all, cavewall had a slew of features that I hadn’t thought possible in text-art program, and didn’t expect to see again. If you’re skeptical, so was I, but aewan pulls it off quite gracefully. And those layers are the key to copy and pasting, moving blocks of images, creating stamp pad effects and even transparent stamping. It’s amazing. You can add dozens of layers to text drawings, set their visibility, name them and rearrange them. Set their dimensions and move them around until you complete your masterpiece. aewan has hotkeys for the color palette, a menu-driven interface with key commands for some of the most important features, and can save all your work into a file that (supposedly; I didn’t try it) can be used in a pager to display animation effects. Wow. 😯 That’s impressive for a program that saw its last update in 2005. My hat is off. Again. For that alone, an incredibly rare and immeasurably valuable K.Mandla gold star is warranted: ⭐ Well done. But … I can see where some features from cavewall don’t appear in aewan. cavewall has adjustable stepping features for example, making line drawing and the like more convenient. aewan doesn’t have that, or if it does, I don’t recall seeing it. aewan does have a specific line-drawing mode though, and that’s quite handy. Pressing the hyphen or pipe symbol actually draws the appropriate extended line, so you can draw in continuous bars, instead of just the text character. But vertical lines aren’t as easy with aewan as they are with cavewall. And neither aewan nor cavewall has the polygon drawing and editing features that were in textdraw. But that’s only black-and-white, and so loses an edge to cadubi, which behaved more like a colorized stamping program that could import images rendered by caca, and edit them. This entry was posted in Linux and tagged art, draw, edit, illustrate, image, text on 2014/11/14 by K.Mandla. 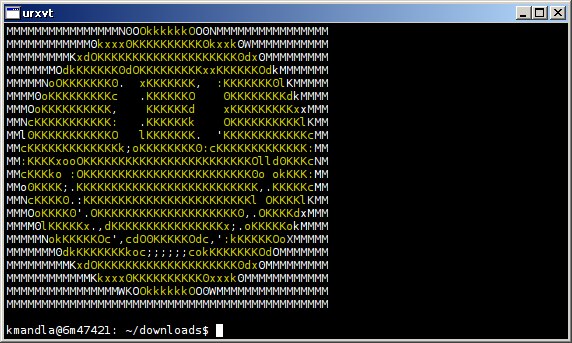 cavewall is another ASCII “image editor” allowing you to draw and create pictures using text symbols and so forth. We’ve seen a few of these in the past, to include classics like cadubi, or hidden gems like textdraw. A lot of the files that are in the latest cavewall tarball date back to 2006 or even earlier. 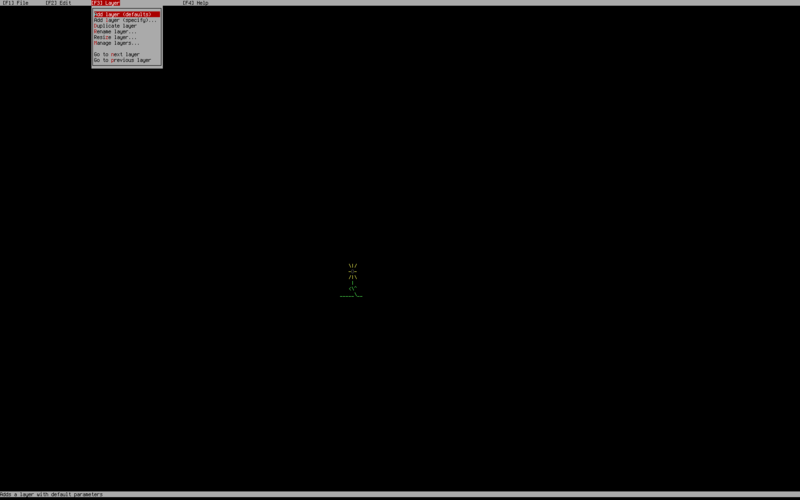 I didn’t expect it to compile, but as you can see, it worked more or less flawlessly. And a lot more. cavewall manages to take a lot of cadubi’s high points, and some of textdraw’s best functions, then add a few bonuses of its own, and combine them all in a very usable way. It’s clear not everything is finished (I would have loved to see the “inject figlet-ized text” feature work), and it needs a little polishing on some points (the menus are sometimes obtrusive, or overwrite themselves, and cavewall intercepts some command sequences as text … small points). But the majority of it seems to be working. I’m going to give cavewall a great big shiny gold K.Mandla star though, in the hopes that someone will see its potential and give it the boost it deserves: ⭐ 😉 Enjoy! This entry was posted in Linux and tagged art, draw, edit, illustrate, image, text on 2014/10/15 by K.Mandla.